Owning a car is a huge investment in itself and one should be more careful and wise to protect it from thieves and other security threats. Vehicle theft like two-wheeler and car have increased steadily in the recent years and many victims are from metropolitan cities. It is difficult to recover the car once lost and it only happens in rare cases that he/she may get the car back. Not to forget the rounds to police station, insurance office for claims and other procedures. Its tedious and of course disheartening to know that you have lost the car that was purchased with hard earned money. Since the security threats are high, one of the way to secure your car is by installing ‘Anti-theft Device’. It is a device or an anti-theft system that is installed in your vehicle to prevent the unauthorized appropriation or access to your car. It can be gear locks, crook locks, ignition or steering wheel locks, brake pedal locks, electronic immobilizer, etc. There are many options you can buy from but keep in mind that all these devices have to be an ARAI approved devices. Automotive Research Association of India is a co-operative industrial research association set up by the Ministry of Industries and Government of India. The ARAI does research and development for automobile products, it also evaluates automotive equipment, security device approvals, product and design development, conducts vehicle tests, etc. Some of the ARAI approved companies are Auto Cop, Minda, Xenos and Nippon. Installation of anti-theft device in your car will not only warn you if mischiefs try to tamper with it, but the insurer will also provide discounts on premium considering you a responsible owner. The insurer encourages to install an anti-theft device because it will also reduce the number of theft claims for the insurer. It is also obvious that the number of car thefts will decrease. Nowadays new cars come with an anti-theft device preinstalled especially for mid-range and luxury vehicles. If it’s not installed, then verify it with dealer and make sure to get it installed. Mahindra, Audi, Land Rover and other luxury car manufacturers and mid-range manufacturers like Maruti Suzuki, Ford, Toyota and Honda do have anti-theft device installed. Nowadays, insurers have made anti-theft device compulsory for two-wheelers as well and are looking to extend this to commercial vehicles as well so that the premium decreases and claims reduce. 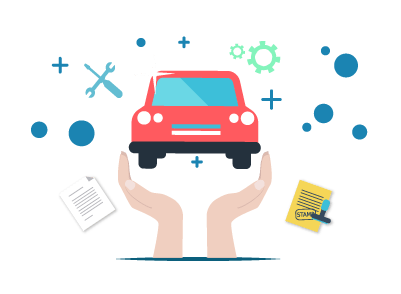 Looking for a car insurance policy? We can help you. Alarm: it makes a loud sound if someone tries to open without a proper lock. Electronic immobiliser: It is a built-in transponder that send signals to ignition and fuel pump systems. Usually these signals are sent through the electronic keys for your car. If they key is not in the car, then it remains inoperable. Keyless locks: To open the driver side car door or to start the car with this type of lock, an electronic coding is required. The car is then operable based only on that code. Vehicle tracking: If you install a tracking device in the car, it can be traced through the help of GPS. Steering wheel lock: On installation of this device, nobody can drive the car without removing the lock. VIN Etching: Etching the Vehicle Identification Number to the car windows is the cheapest and quickest fix as anti-theft device. It is done with the use of stencil and a chemical that permanently inscribes the VIN number onto the windows. If a mischief tries to steal your car and sell it, it would be difficult as the buyer may have to replace all the windows. It will also be easy for the police to identify your vehicle. The discounts available for installing an anti-theft device depends on the insurer and it is calculated on pro-rata basis as per the policy chosen by you. The cost for anti-theft device or system depends on the type device you chose, but choosing a technology enabled system is a smart decision as it is a onetime investment. It can cost you anywhere between Rs. 3000 to 17,000.